Blacklands in Commerce, Jason Davis photo. granted the authority to issue revenue bonds. is an established governmental subdivision of the state of Texas representing six contiguous counties across northeast Texas, overlapping the service area of TAMU-C, including: Titus, Franklin, Hopkins, Delta, Hunt, & Collin Counties. was formed in 1995 to save the former St. Louis Southwestern (Cotton Belt) Railway’s Dallas Division, or "C-Branch," from abandonment and preserve rail service for current and future customers along the corridor and ensure the potential for long-range economic growth in the region. owns, or jointly owns with the state of Texas, 65.6 miles of operational railroad plus 23.2 miles of right of way with rails removed for a total corridor length of 88.8 miles. contracts with Blacklands Railroad, Wayne Defebaugh, president, as operator of the railroad. Board of Directors dedicated to the success of the rail district and promotion of the economic vitality of the region through expanding the availability of multimodal capable rail service. An active short line railroad on which railroad and transportation related research studies or training could be conducted. Established rail service enabling and promoting economic growth by attracting large and high volume industrial operations to the region. An award-winning operator (Blacklands RR) that has substantially grown the number of customers on the line and achieved a progressively increasing car handling count up to 3033 in 2008. Interchanges with two Class 1 railroads: Union Pacific & Kansas City Southern. Right of Way adjacent to proposed Collin County Intermodal Facility/Inland Port. Right of Way connecting to DART ROW enabling future rail passenger connections to/from the DFW Metroplex. Opportunities for development of tourism through railroad passenger excursions, motorcar runs, etc. Consultants with rail and related expertise. Connections to key political figures, individuals, organizations, and entities involved the areas of transportation and regional economic development. State and National Congressional Leaders. In 1981, Texas approved the legislation calling for the creation of rural rail districts throughout the state. By March of 1999, 11 rural rail districts, consisting of over 50 Texas counties had been developed. Rail districts can be formed in Texas by any one or more consecutive counties. 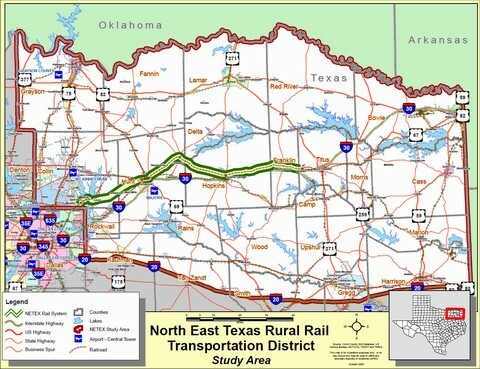 Following the application for abandonment of the Dallas Division of the Southern Pacific's subsidiary St. Louis Southwestern, the Cotton Belt, the four counties of Hunt, Hopkins, Franklin and Titus formed the Northeast Texas Rural Transportation District, NETEX. 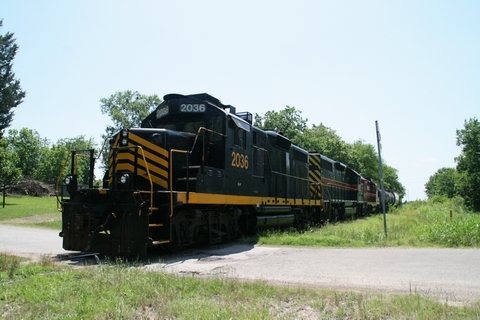 On November 9, 1995, five years after the closure of the branch, and before Union Pacific's takeover of SP, the rail district took ownership of 31 miles of track from MP 555 just west of Greenville to MP 524 just west of Sulphur Springs, for a purchase price of $2,000,000 and an immediate investment of $225,000 for track remediation and repair. SP had reserved ownership from MP 524 to Mount Pleasant for two reasons. First there was a strong possibility that a large carload shipper would move into Sulphur Springs, and second there was the utility track between SP and KCS east of Winfield, just west of Mount Pleasant in Titus County. On October 1, 2000, almost five years after the first purchase, NETEX bought the Union Pacific track from Milepost 524 to 489.4, at the Franklin County/Titus County line. The purchase price was $1.3 Million. NETEX also purchased the abandoned segment of right of way between MP 555 at Simtrott and MP 575.4 near Wylie to preserve the corridor for the future restoration of freight rail service and to enable a western connection to the Dallas Area Rapid Transit (DART) System for possible passenger service. Since its formation, the counties of Collin and Delta have joined the membership of the district which now represents six member counties and is governed by a 12 member board of directors comprised of two county court appointed representatives from each member county. The views and opinions expressed on this page do not necessarily represent those of the university. Contents © NETEX, unless otherwise noted. All rights reserved.